Hydraulic upenders, built by Bushman Equipment, Inc., upend coils, molds, dies, paper rolls, cylinders and other heavy, bulky loads and turn them within a 90-degree radius. 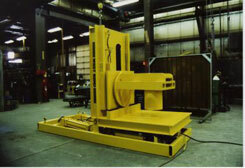 Hydraulic coil upenders handle heavy jobs smoothly and efficiently. This hydraulic roll upender has a powered conveyor and a U-shaped saddle for upending paper rolls. This coil upender has a powered V-saddle and a clearance slot for the c-hook which places the steel coils on to the V-saddle. Bushman Equipment, Inc. designs and builds several types of hydraulic upenders with fully integrated, heavy-duty hydraulics for precise positioning. 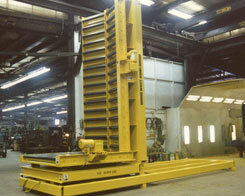 Bushman Equipment, Inc. thoroughly tests each hydraulic upender at our factory. The hydraulic upender’s power unit provides an ideal power source for secondary functions such as shifting saddles and pallet centering. Bushman roll upenders are designed for changing rolls and coils from one orientation to the other. A roll upender is used to safely reposition large and odd shaped objects. Rugged, heavy-duty welded steel plate, channel and tube construction go into each Bushman Equipment, Inc. hydraulic upender. High-quality double-acting tilt cylinders rotate the platforms. Loads rotate around heavy-duty pivot bearings, complete with lubrication points. Electrical limit switches halt rotation at each end of the pivot cycle. Hydraulic upender platforms can handle a wide variety of load configurations, including long loads such as paper rolls, or other loads whose length is significantly greater than its width or diameter. Many industrial applications require tilting which is an available option for hydraulic upenders. Various types of conveyor decks are available to accommodate specific loads. Traveling upenders can be equipped with wheels for rail travel or mobile use. 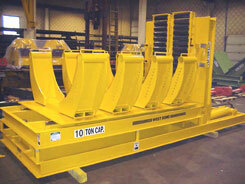 Bushman Equipment, Inc. upenders can be modified to work in most systems with automatic operation. One platform on a hydraulic upender may be significantly smaller than the other, making these upenders suitable for loads that are larger in one dimension. These coil upenders can also handle more than one coil. Guarding and warning labels comply with industry standards. 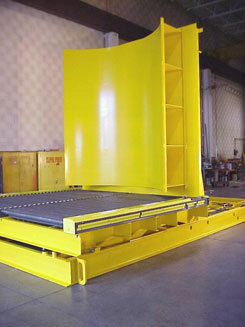 This is a hydraulic tilt-test table. E-One makes customized crash and rescue vehicles and needs to test at what angle the vehicle becomes unstable since many of them operate in off-road environments. Maximum lifting capacity of the table is 150,000 pounds and the maximum tilt angle is 40 degrees. This Bushman Equipment, Inc. hydraulic roll upender is designed to palletize and de-palletize loads of laminated paper or other materials. 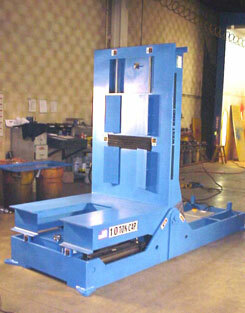 The unique design of this hydraulic coil upender, hydraulic coil tipper, allows it to unload slit coils from a turnstile, rotate the coils, and down end them onto a pallet. 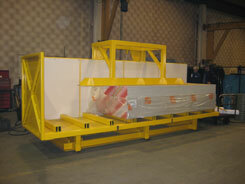 This traveling upender includes a track mounted platform to shuttle the coils to different load areas. 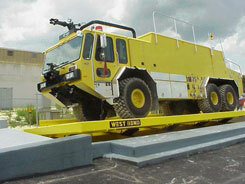 This hydraulic upender was designed to upend loads of drywall, even when they are offset. The wall is incorporated into the left hand end of the upender to assist the forklift operator in squaring up the load. The loading deck of the load platform has removable fork guides.